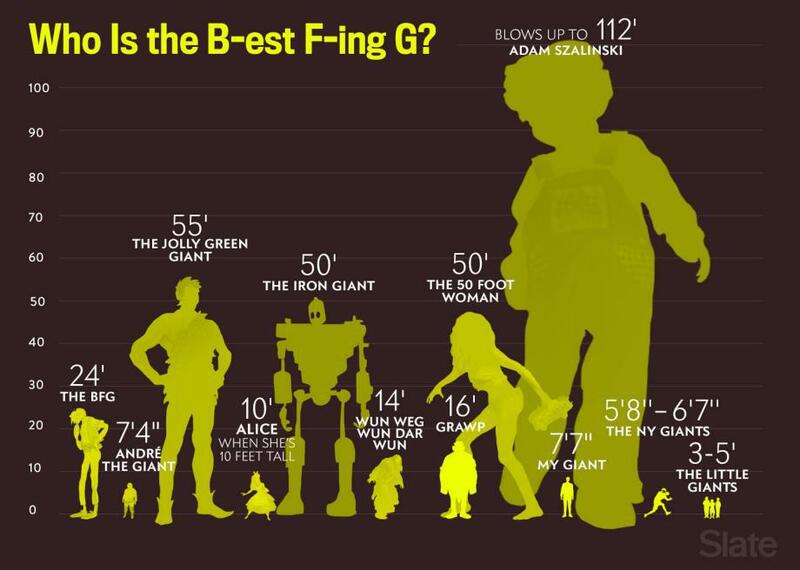 The height of the BFG and other movie giants, charted. This Friday marks the release of The BFG, Steven Spielberg’s adaptation of Roald Dahl’s story about a lovable hero whose initials stand for “the Big Friendly Giant.” But just how B is this FG? To compare him with the other iconic giants of pop culture, we created the chart above. A note on methodology: We limited our giants to humanoids or figures who are explicitly identified as giants, which means no giant apes, giant lizards, or the like. Also: We selected only one giant per movie, TV show, or book, and no half-giants. (Hagrid fans should please refrain from sending us their angry owls.) Finally, where heights were not explicitly defined, we strived to use the best estimates available—though height sometimes varies even from scene to scene.